Prohealth employees, from left: Simon Apap, Denise Copperstone and Yan Pirotta. Prohealth markets two of the most sought-after sunscreens on the island, Ideal Soleil by Vichy Laboratories and Anthelios by La Roche-Posay. As advocates of sun awareness, Prohealth’s aim over the summer months is to increase awareness about the damaging effects of the sun and how to protect everyone, be it children or adults, with the right type of sunscreen whatever the skin concern. 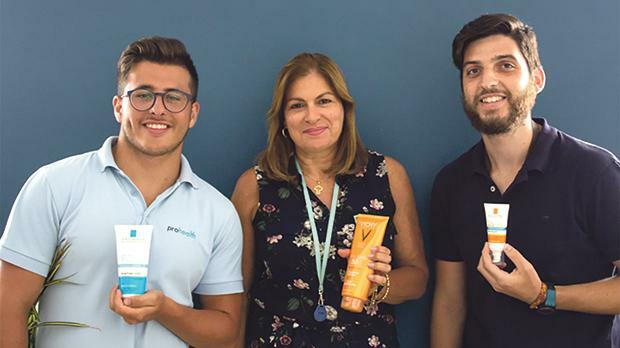 As part of its ongoing efforts, Prohealth invited a dermatologist consultant to thoroughly check each employee for any irregularities on their skin and each employee was given a free high SPF sunscreen. In light of all this, the entire Prohealth team joined forces to create an awareness video about the importance of protecting yourself in the sun, which was posted on Prohealth social media pages.